The sandy trail leading up Horseshoe Canyon offers soft footing, slowing the pace, quieting my steps. 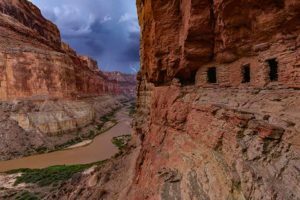 Along the canyon floor, cottonwood trees shimmer with fantastically bright yellow leaves below pastel sandstone cliffs, and a shallow, meandering creek glistens and sparkles under the deep-blue autumn sky. 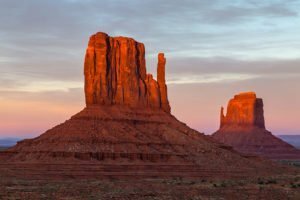 After driving a 31-mile dirt road from the highway, then descending a 750-foot cliff on foot down switchbacks into the canyon, a three-and-a-half-mile trail then takes me to the most revered rock art panel in the entire American Southwest. 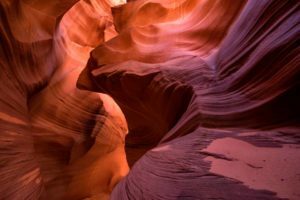 Photos I had seen show a majestic, otherworldly grouping of ghostly figures spread two hundred feet across that appear to float above the canyon floor. Walking up the canyon in this remote extension of Canyonlands National Park, I reflect on what I’ve read about this place. The twenty or more life-size figures were painted 2,000–8,000 years ago. 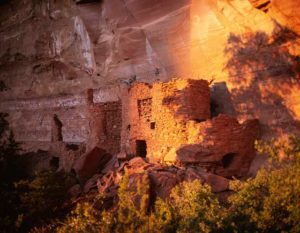 During this time, the nomadic hunting and gathering people slept in brush shelters in caves. Along the trail, small collections of pictographs appear up on the cliffs and hidden in caves. In the back of one enormously large alcove, I discover a series of roughly painted pictographs on the pale-peach sandstone. They sit low to the ground in faded red, gray, and brown. Sounds in this space seem to float and shift. In the middle of the alcove, I sing a sustained single note into the curved ceiling of pale stone. As I fine-tune the pitch, duration, and direction, it creates a new pattern of resonance. With subtle nuances, I soon find an unexpected moment when my voice starts to harmonically resonate with its echo. The energizing sound washes over me, and the sustained reverberations penetrate deep inside me. The sandstone cavern seems to come alive. I head out to once again find the trail, and traversing a narrow gap in the canyon, I hear sounds gently echo again and again, and then vanish. After hiking a few hours, I walk around another bend in the canyon, and there, at a distance, I see the work of an ancient artist. The sheer size of the shamanic figures draws me forward. Majestic, yes. Magical. Mysterious, too. A prominent seven-foot-tall supernatural figure tells us that observing the cosmos was significant and vital. The figures have empty eyes, no legs or arms, and short antennae on their heads. The greatest art always expresses genuine inspiration, coming from some seemingly hidden realm. Soulful expression is informed by an artist’s experience and awareness, and then it’s channeled through his or her receptive being. These huge anthropomorphic images are bold, multicolored, and deeply inspired. On a particular day, this tall canyon wall was like a blank canvas ready to receive the artist’s idea. In that initial application of paint, the rusty-red pigment began to tell a powerful, yet silent story. I wonder where the artist’s moist paintbrush first touched the cliff wall to begin this over-sized masterpiece? Inside one of the large humanoid figures I can see two dogs seeming to face off in a hostile duel. Near the figures are tiny symbols, a row of herd animals, and a pair of humans engaged in combat. A young family arrives at the site. Then, a retirement-age couple walks up. We all take cover from the bright sun under a few small cottonwood trees. The older man pulls binoculars from his daypack, and soon delights in discovering barely perceptible details in the rock art. He shares the binoculars for each of us to see. Through the binoculars I see a row of tiny, incised marks that look like fringe across the chest of one figure’s attire. Small white dots, surprising accents of turquoise, and faint incised patterns also reveal nuances undistinguished by the naked eye. The detail within the ghostly figures is astounding. All of our conversations fade to an attentive hush. 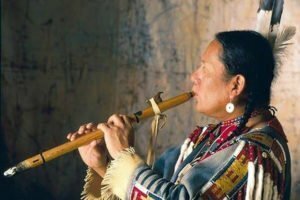 Flute music begins drifting down the remote canyon, notes float and echo along, and then again—softer, quieter—and then finally dance away. Someone who has hiked farther up the canyon is playing a soft and improvised melody from a wooden flute. In each long breath, the music brushes around the canyon corner, its presence lingering and beautiful. 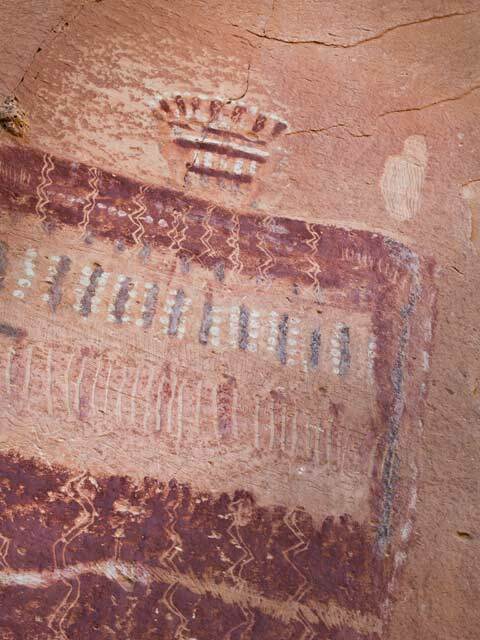 Spellbound, we absorb each sound into our memory as the echoing notes complement the ancient pictograph art. The Great Gallery is alive with both ancient and in-the-moment creativity in a harmony of past and present. The musician eventually returns to the glyph site. Heart-felt thanks are given for the gift he has given us. Among the compliments, he is offered chocolate, an appreciative currency for those sharing time in the wilderness. The ancient pictograph artist will, instead, miss the audience’s response to his mystical and timeless paintings. How do we say thank you? I hope sincere gratitude is truly enough.